When it comes to popularity, there is no doubt that State Counselor Daw Aung San Suu Kyi’s status is unrivalled in Myanmar. Dubbed the national icon of modern Myanmar, she is still as active and elegant as ever despite her advanced years. Many of her supporters do not like to see or hear any perceived criticism of her and, therefore, there is reason to believe they would get angry at a representation of the State Counselor with a wrinkled face and white hair. This portrait, however, is not Daw Aung San Suu Kyi at present, but in 2050, when she would be 105, and is one of the paintings being shown at the ongoing ‘Myanmar 2050’ art exhibition in Yangon. 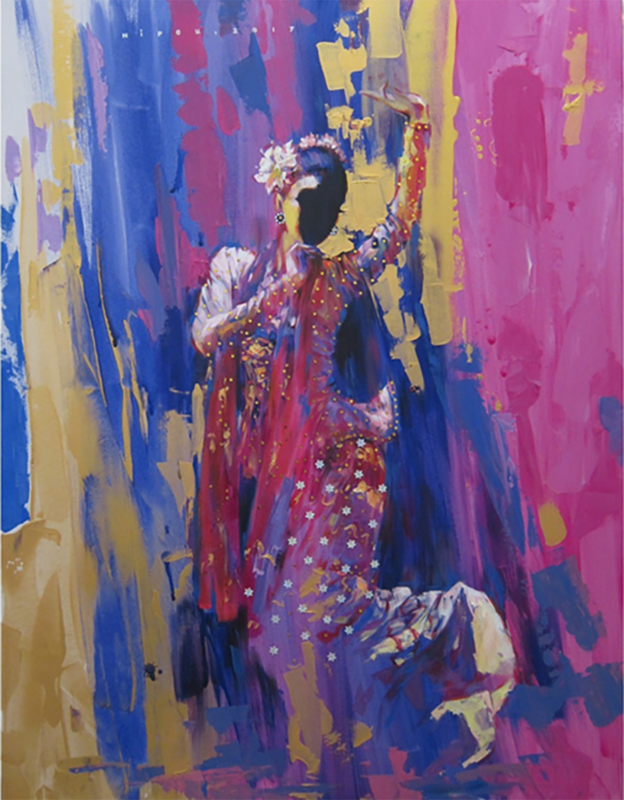 “Remain Unchanged,” a painting of a female traditional dancer by Ni Po Oo, reflects his belief that Myanmar’s traditional culture will live on. “I have depicted the facial wrinkles that she will get when she is 105. Though she will have wrinkles because of her age, take a look at her shiny eyes. This means she is always ready [to work] for her country,” said artist Hla Tun. The exhibition features the paintings and sculptures of a total of 35 artists who have envisioned Myanmar in 2050. 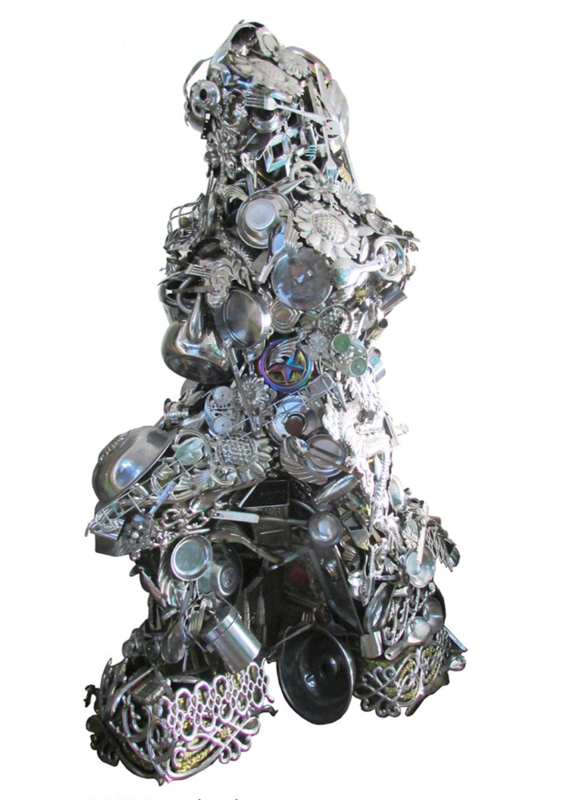 Myat Kyawt created a sculpture made of kitchen utensils. “This sculpture represents Myanmar’s diversity as I envision Myanmar as a more united and dynamic country by 2050,” he said. Myat Kyawt created a sculpture made of kitchen utensils to represent Myanmar’s diversity and latent dynamism. 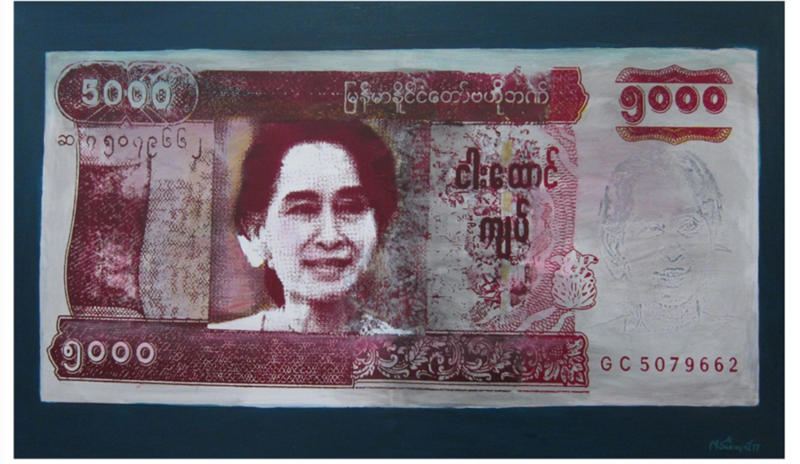 Myint San Myint’s creations include a 10,000-kyat banknote with the picture of Gen Aung San, who is widely regarded as Myanmar’s independence hero, and a 5,000-kyat banknote with the picture of his daughter, Daw Aung San Suu Kyi. “It has been a long time that our banknotes have had no images of humans,” Myint San Myint said. “Despite scientific and technological advancement, I believe that Myanmar’s traditional culture will live on,” he said. The exhibition will be on display at the River Gallery on 37th Street in Yangon’s Kyauktada Township until Sunday.